There was Kobe Bryant last night… gliding through the air… flailing like a cartoon character falling off a cliff every time he got touched… and shooting. Oh… was Kobe ever shooting. A lot. Kobe shot 12 of 20 last night. Better than 50%. Good shooting night from Kobe. But it was his, ahem, passing that I REALLY loved to watch. All… ONE… of his assists were gorgeous. See for yourself: It was this one… to Pau Gasol (the look on his face is priceless. 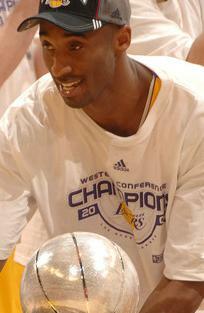 “Zee ball… she finally escapes Zee Mamba!”). It didn’t matter if 2 guys were on him with Pau Gasol wide open. Or if he had 2 options to give a teammate and easy dunk. Or if he was way off balance with 3 guys staring at him (leaving SOMEONE open). Or if he was so far under the basket that it would have seemed like a bad shot for even plastic man to attempt. Or… well… you get the point. Kobe Bryant shot the ball 20 times. Sasha Vujacic was second on the team… with 10 attempts. I will take that kind of game from Kobe every time. In fact… I’m begging him to play that exact same game again. Same for the rest of the Lakers. If there is some magic spell that would allow for all of those same shot attempts in Game 4… I’d sign up for it right now. Because Kobe was “Bad Kobe” last night. Sure, he was on fire… but don’t be fooled… He was “Bad Kobe” through and through. Doubling up your teammates shot attempts is big-time bad. One assist is mega-bad. 87 points from the “vaunted” Lakers offense… at home… in Game 3 of the Finals… is a boy-band made up of week-one ‘American Idol’ rejects bad. So keep shooting Kobe. Take 20 shots again in Game 4. 25 even. Hell… make it an even 30. Every shot you hoist… just makes things easier for the Celtics. This is always a fun one for Lakers fans. We’ve been saying this for a while. In fact… here’s a little something from 2 years ago. The simple fact of the matter is that Paul Pierce is, was, and will continue to be better for an NBA team than Kobe Bryant. Sure, Kobe’s more explosive, athletic and prone to give you a “SportsCenter” moment… but Paul Pierce has been just as effective, more efficient, and a better influence on his team. Their career averages are all virtually equal… yet Pierce has had far fewer public meltdowns and squabbles. And now, in these NBA Finals, both players are putting their legacies on the line. Pierce risks being branded as a second-tier star that is doomed to a ring-less retirement and a slow fade into obscurity as the years pass. Kobe risks being the guy who could never climb into that pantheon of mega-stars that could single-handedly carry his team to a title. Everyone (at least, everyone not in Boston) figured Kobe was a lock. The word “coronation” was thrown around a lot. But the funny thing is that so far… Paul Pierce is the far better player. In fact… their Finals numbers look a lot like their career numbers: Pierce is averaging a couple of points less while taking fewer shots and shooting a higher percentage. At this rate, Paul Pierce will be the Finals MVP… and Kobe faces the prospect of never getting out of Shaq’s shadow. LA fans will never accept that Pierce is in Kobe’s class… but Pierce isn’t giving rational basketball fans much choice. Celtics-Lakers, Game 1. Boston’s stifling team defense keeps arguably the best player in the game out on the perimeter and out of the lane. The superstar shoots an uncharacteristically low percentage. “I had some good looks, they just didn’t go down for me,” a resolute Kobe Bryant said. Celtics-Cavaliers, Game 1. Boston’s stifling team defense keeps arguably the best player in the game out on the perimeter and out of the lane. The superstar shoots an uncharacteristically low percentage. “I missed a lot of shots I know I can make,” James said, staring at the stat sheet incredulously. I don’t know what Game 2 of the NBA Finals is going to bring… but I do know this: The Celtics can successfully keep a perimeter star that wants to drive… out on the perimeter. They have a plan of attack on defense that forces that perimeter player to do just enough different… that those shots fall just short… or just long. The difference between the Lakers and the Cavs is… the Cavs are a much better rebounding team. If the D can keep Kobe just off balance enough in Game 2…. he WILL go into hero-mode… and we’re going to see the good ol’ 25-30 shot, no-pass Kobe try to find his range. Kobe has a legacy to consider here. He’s going to try to win this on his own. I think the C’s will be happy to let him try. Scott Souza has a few notes coming out of what is becoming a growing media circus… which is to be expected. The one thing that stuck out to me was Paul Pierce… talking about the offseason conversations he had with Kobe. One other thing of note from the Zen master… regarding this season’s C’s-Lakers matchups. I don’t know if he’s kidding here. It’s a big question: How will the Celtics defend Kobe Bryant? The answer might be… to let him keep shooting. The more shots he takes… the less the rest of the team is involved in the offense. That means Lamar Odom is more likely to drift off… and the Euros are more likely to whine about not shooting (which makes them more likely to jack up ugly shots when they DO touch the ball). I think its sad that Kobe’s ego is so fragile, that Phil feels the need to say things like this. Hey Phil… there’s a Mr. Jordan on line one for you. At 11:59 p.m. last night, I was strolling happily in my backyard with my new dog. Everything was right with the world… even though I was standing in the dark and cold with an animal that was too nervous to figure out that the whole song and dance was in an effort to make her poop. ‘No matter,’ I thought. I’m happy to do it for a new friend. Suddenly, the taste of bile appeared in the back of my mouth. I’d felt it before, but this time it wasn’t tinged with remnants of Jager and whatever I pointed to on the Denny’s menu at 4am. ‘How odd,’ I thought. By the time we hit the door, I was sweating and nearly doubled over in pain. Holding back dry heaves, I quickly tried to figure out what I did make me feel this way. Then I saw the clock. 12:04. It was March 11th. The day I have to say nice things about Kobe Bean Bryant. I can’t call him a douchebag. I can’t call him a me-first malcontent who, instead of waiting to see how young talent would develop around him, decided to go on a schizophrenic “trade me, don’t trade me” public display. 3 cases of Pepto later, I think I’m ready. The best thing I can say about Kobe Bryant is: I hate him. No really, that’s a compliment. Most people who have played sports will tell you… they enjoy being booed on the road. To paraphrase Curt Schilling… there’s something very satisfying about shutting thousands of people up. When the other team’s fans target you specifically… they’re not doing it because you’re an OK player. You’ve got to have some skills to draw the vitriol of 17,000 strangers. To be targeted specifically, you have to have done memorable things to the opposing team. Opposing fans don’t remember 5 points and 3 rebounds. But they remember 42, 10 and 10… including a dunk on your whole front line and the game winning fadeaway 3. Look… the world needs villains. No one plays cops and cops. Without villains, there is no Superman. Batman doesn’t really become Batman if his parents aren’t killed. Hulk Hogan doesn’t become Hulk Hogan without the Iron Sheik walking around with an Iranian Flag saying “America… ptew!” The same is true of the NBA. It needs the bad guy that occasionally wins. And yes, that means championships too.